The features of Louis XVI were noble enough, though somewhat melancholy in expression; his walk was heavy and unmajestic; his person greatly neglected; his hair, whatever might be the skill of his hairdresser, was soon in disorder. His voice, without being harsh, was not agreeable; if he grew animated in speaking he often got above his natural pitch, and became shrill. The Abbe de Radonvilliers, his preceptor, one of the Forty of the French Academy, a learned and amiable man, had given him and Monsieur a taste for study. The King had continued to instruct himself; he knew the English language perfectly; I have often heard him translate some of the most difficult passages in Milton’s poems. He was a skilful geographer, and was fond of drawing and colouring maps; he was well versed in history, but had not perhaps sufficiently studied the spirit of it. He appreciated dramatic beauties, and judged them accurately. At Choisy, one day, several ladies expressed their dissatisfaction because the French actors were going to perform one of Moliere’s pieces. The King inquired why they disapproved of the choice. One of them answered that everybody must admit that Moliere had very bad taste; the King replied that many things might be found in Moliere contrary to fashion, but that it appeared to him difficult to point out any in bad taste? This Prince combined with his attainments the attributes of a good husband, a tender father, and an indulgent master. Unfortunately he showed too much predilection for the mechanical arts; masonry and lock-making so delighted him that he admitted into his private apartment a common locksmith, with whom he made keys and locks; and his hands, blackened by that sort of work, were often, in my presence, the subject of remonstrances and even sharp reproaches from the Queen, who would have chosen other amusements for her husband. Austere and rigid with regard to himself alone, the King observed the laws of the Church with scrupulous exactness. He fasted and abstained throughout the whole of Lent. He thought it right that the queen should not observe these customs with the same strictness. Though sincerely pious, the spirit of the age had disposed his mind to toleration. Turgot, Malesherbes, and Necker judged that this Prince, modest and simple in his habits, would willingly sacrifice the royal prerogative to the solid greatness of his people. His heart, in truth, disposed him towards reforms; but his prejudices and fears, and the clamours of pious and privileged persons, intimidated him, and made him abandon plans which his love for the people had suggested. The King was born weak and delicate; but from the age of twenty-four he possessed a robust constitution, inherited from his mother, who was of the House of Saxe, celebrated for generations for its robustness. 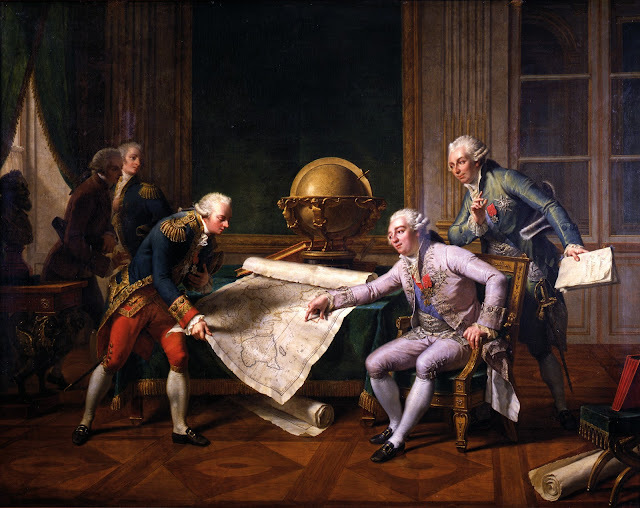 There were two men in Louis XVI, the man of knowledge and the man of will. The King knew the history of his own family and of the first houses of France perfectly. He composed the instructions for M. de la Peyrouse’s voyage round the world, which the minister thought were drawn up by several members of the Academy of Sciences. His memory retained an infinite number of names and situations. He remembered quantities and numbers wonderfully. One day an account was presented to him in which the minister had ranked among the expenses an item inserted in the account of the preceding year. “There is a double charge,” said the King; “bring me last year’s account, and I will show it yet there.” When the King was perfectly master of the details of any matter, and saw injustice, he was obdurate even to harshness. Then he would be obeyed instantly, in order to be sure that he was obeyed.